I knew I would write this eventually. What is ironic is, I have read every post on this topic from every youth ministry site—large or small—on the internet. From the time I knew the Lord was calling me out of my current job and to another ministry, my heart was grieved with the idea of leaving my current church on bad terms. I am in the interesting position of having grown up, saved, baptized, married, and then becoming the youth pastor of the same church. So even considering leaving the church that has almost two decades of my life woven into those pews was not an easy decision to come by. It took months of prayer, tears, seeking wise council,tears, prayer, reading, tears, fasting, prayer, and more tears to come to the decision of moving on to my next ministry. When I got to that decision I began the process of doing all that I can to leave well. This is what I did and this is what worked and is currently working for me to leave well from my current ministry position. Kept it to myself. From the time I knew I wanted to leave, I didn’t talk about it to a ton of people in my church. Rumors spread quickly in every church and I didn’t want my leaving to be misconstrued as a scandal or me being run off. I was and am in good terms with my Elders and my church. My students still loved me and I had a growing and fruitful ministry. So I just confided in my wife and the Lord for a long period of time as to make sure this was really the door we were to step through and not just me being bored or discontent. After sometime I confided in good friends who I trusted who were in youth ministry. I love the Youthmin.org community. This isn’t a shameless plug, the contributors of that site love youth ministry and love youth pastors. They all listened to me, prayed for me, and gave me sound wisdom as I was about to embark on the biggest decision since I decided to marry my wife. This stayed this way until I made my first big step in transitioning. Talk to my Senior Pastor. I was sort of afraid to do this. 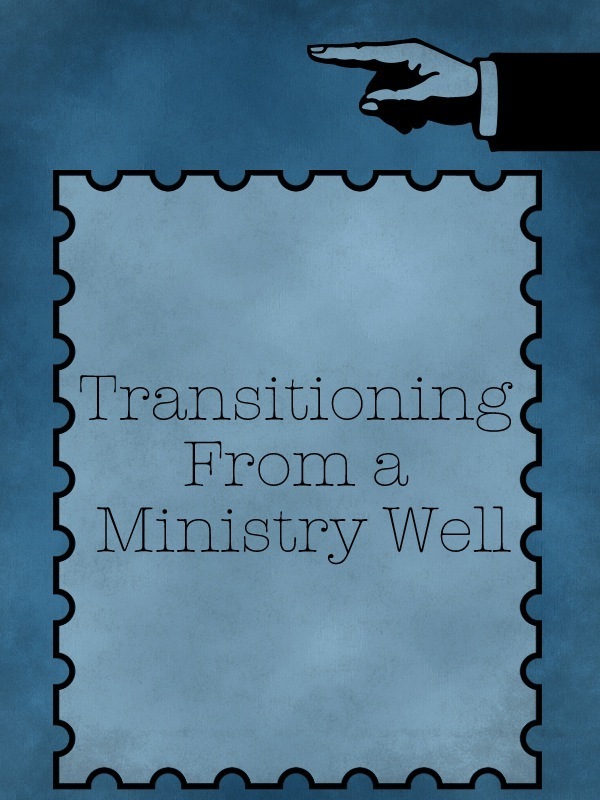 I had never seen a good example of someone transition ministries on good terms. They all were either fired or asked to leave nicely. So two days after Thanksgiving, I called my senior pastor, asked to meet with him, and I drove to his house and sat in his living room. I was honest and respectful. I basically told him, “I feel the Lord is calling me to move on.” He took it better than I could have imagined. My senior pastor is one of the most grace-filled men I know. I am not saying that just because he may read this post and he signs my paychecks; I am saying that because he is the real deal. I willingly sat under his teaching for years and desired to be discipled by him at my first pastoral position. He encouraged me and gave me advice on how to leave well from my church. Patience. After I met with my senior pastor, I just patiently waited as I sent out my resume to every church that loves Jesus. Seriously, I applied to a ton of churches I can’t even remember the number. I had to wait. We had only told my Senior Pastor and the Elders at this point and we felt it was in the best interest to the rest of the church to not share our intentions of leaving until we had a strong offer. This was wise. It was painful, but it was better to be patient for something solid than being a lame duck and having everyone know I was leaving but didn’t know where to yet. Then I got the phone call from Arkansas. The awkward and fast part of my transition. A church in Arkansas called me and asked for an interview with their search committee. That then turned into an interview with their senior pastor. That then turned into them flying my wife and I out to Arkansas and teaching at their midweek service. Before I left for the visit my senior pastor warned me that once I fly out there it will be hard to keep this under wraps. It is not that we are trying to hide anything, but information has a season when it is good to be shared. I flew to Arkansas and I started to get texts from friends and students. They asked me, “Why are you in Arkansas?” “Why are you teaching at another church’s youth group?” “Are you going to meet Mike Huckabee?” I told everyone the truth. A Church wanted to fly me in to teach at their youth group. By the Lord’s grace no one pressed on that anymore. I think people assumed my status of a traveling preacher has come to life and I am now the Cuban Matt Chandler. I got back to Tampa and about a week after my visit I got an offer from the church to be their youth pastor. Cori and I accepted the position, we told our senior pastor and the elders and now I knew where I was going to go. The big day. The Elders and I agreed that since I now know I am leaving and their students will soon bombard my Twitter, Instagram, and Facebook with questions and excitement, we should tell the church and the students that following Sunday. I met with a few close friends that Saturday to share what was going on. That was a long and emotional Saturday. The Friday before, I sent an email that I wanted the parents of the students to be in the Sunday school with the students for a special announcement. The kids were suspicious but they were not expecting what I was going to share with them. I cried a ton and the students and parents cried too. However, it was healthy and it was taken well. The students were sad but were mature enough to be excited for me. At the end of the main service I was called up and my senior pastor let the congregation know and the whole church was sad but happy for me. I think the best way to describe the feeling was “Bitter-Sweet”. All in all, it was handled well, no rumors could be spread and I was on track to leaving well. The last part. So since the big announcement there has been lots of packing, visiting independently-owned Tampa restaurants, and lots of good hangs with friends. One thing about leaving well that I didn’t have control over was keeping this part short. I am still here for another month. There is just too much to transition over and a lot of work needs to be done before I can leave. The new church has been really cool with it all and they are just excited that someone is coming soon. My goal for this final month is to teach all the lessons that I feel are needed to be said for me to leave in good conscious and to spend time with friends and family. The biggest challenge is to not be bitter or become lazy. It is easy to stop caring about pastoral care because you can say, “I won’t see them again after a month” or slack at work because you know you don’t have to plan past a certain date. My wife has been a big support by praying with me daily to finish strong and leaving well. I am going to miss my students, my friends, and the only church I have ever been a part of since the Lord saved me. But praise God the relationships will not be tarnished by a nasty break-up. Leaving well means I have good connections back in my hometown, a sofa to sleep on when I visit, and a group of students that will remember their youth pastor as a guy they loved and respect. Not some schmuck who left them to dry. I hope you have the opportunity to leave in the grace and dignity I have been able to leave in. Every context is different and you don’t have much control over circumstances, but you have control over how you react and respond. Leaving well is mostly how you respond and react to the circumstances given. Born and raised in Tampa, FL, Frank just recently became the Youth Pastor Family Life Bible Church in Conway, Arkansas. He is married and has zero kids. He blogs about youth ministry at YouthMin.org and has a personal blog about what interests him at FrankGil.me. Great post. Thanks for sharing. I think for me the hardest part would be to talk with my Sr pastor. It’s awesome to read that he gave you time to look. Sad to say that’s not true for every one. My pastor and I have a great relationship, but we have had this talk that if I ever felt called to leave I should have another position before I tell him. He explained it to me and I totally agree and understand his reasoning but I couldn’t help but feel like I’m sneaking around and not being loyal to him and the church. Thanks for sharing your thoughts. I think the key is to be on the same page as your senior pastor. If he wants you to tell him that you’re looking than tell him. If he doesn’t want you to tell him until you have found something, don’t tell him till you find something. Clear communication between yourself and the senior pastor is key.